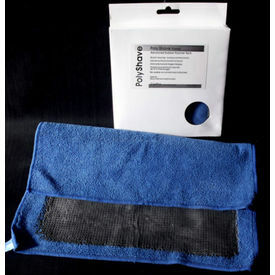 POLYSHAVE DECONTAMINATION TOWEL NO FEAR OF DROPPING CLAY AND WASTING IT!!!! For professionals and enthusiasts alike the Polyshave Decontamination Towel is a simple and fast method to remove contaminants from the surface of exterior automotive finishes and glass. Our Polyshave towel is the 3rd option in our Polyshave line and is constructed to last much longer than clay. With our advanced Rubber Polymer Technology bonded to a 12" x 12" Microfiber towel you have another excellent option from CarPro for eliminating the need for detailing clay. For years clay was THE cornerstone of vehicle decontamination but now with our Polyshave Towels, Pads, and Blocks, Iron X, TRIX, and Tar X we offer a variety of methods to remove decontamination from the surface. Like clay the Polyshave Decon Towel removes the above surface contaminants but UNLIKE clay it is not nearly as time consuming. Also unlike clay if you drop any product from our Polyshave line it can be rinsed off and still used! With clay anytime its dropped it becomes instant trash and must be tossed out. Our CarPro Polyshave towel not only rinses easily but outlasts clay time and again. Durability: Unlike clay this will last through many vehicles! 2.For first use break in PolyShave towel by using on windshield and glass before paint. 3.Keep surface well lubricated with Ultima Paint Guard Wash, Ultima Waterless Wash Plus or your favorite clay lubricant. Be sure to allow the Iron X to remain on the paint 5 +/- minutes just as you do when using Iron X exclusively.